International organization, which unites national accreditation services from all over the world, which conduct conformity appraisal (management systems, products, personnel,..) IAF assures that national accreditation services are competent and independent and that worldwide system of nonconformity appraisal shall be united and credible.Through National accreditation services certification bodies are accredited (QSCert is one of them and is accredited by CAI – The Czech Accreditation Institute). All members of IAF have signed MLA agreement (Multilateral Recognition Arrangements), which assures that awarded certificate from each certification body, accredited by national accreditation service (national accreditation service must be member of IAF), is valid and accepted by all other members of IAF - this means all over the world. IAF has got authority, which means that countries which do not have own representative in the IAF, accept certificates awarded by IAF accreditation. EA was established in 2000 as an organization for covering conformities appraising within the scope of certification of management systems, but also in other areas (testing and calibration, certification of products, certification of people, inspection activity and verification of compliance with the environmental management system according to EMAS). 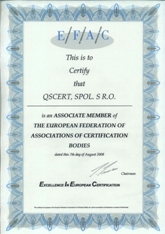 Members of EA are national accreditation services from members of European Union and EFTA or countries which are applying for membership in EU and EFTA. It is non-governmental organization, which elaborates and issues standards, technical reports and instructions. It dealt with more than 13 700 international standards, it has been an elaborator of ISO 9000 and ISO 14000 standards. It coordinates creation of international standards within 145 countries, it cooperates with other international organizations dealing with related problems and supports the harmonization of standards and their application within the worldwide values. It realizes activities through 225 technical commissions (ISO/TC) oriented according to thematic areas. Technical commission ISO/TC 176 covers commissions, which have been authors of ISO 9000 standards. Authors of ISO 14000 standards have been the commissions which belong under the technical commission ISO/TC 207. The European Federation of Associations of Certification Bodies, [EFAC], was founded in 1998 in response to a concern that European certification bodies lacked a focus for the promotion of their collective and individual interests both within Europe and further afield. The founder members were the trade associations VAZ of Germany, AIOICI and ALPI of Italy and ABCB of the United Kingdom and EFAC was formally registered in the U.K. as a company limited by guarantee in February 2002. 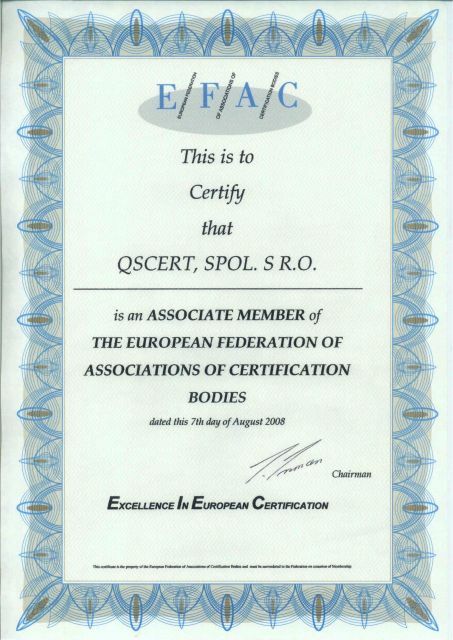 QSCert® became a member of EFAC on 7th August 2008.